On June 21st in Los Angeles GLORY will hold their Last Man Standing PPV, featuring the Last Man Standing Middleweight tournament. The winner walks away with the GLORY Middleweight Championship and bragging rights. 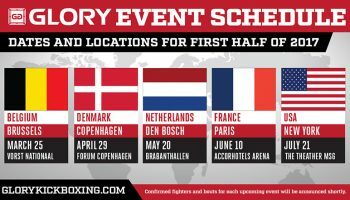 We’ve already heard two of the tournament bouts; Joe Schilling vs. Simon Marcus and Melvin Manhoef vs. Filip Verlinden, now we get the final two today. Artem Levin will face GLORY 14 Middleweight Contender tournament winner Alex Peireira, while Wayne Barrett will fight Bogdan Stoica. Both of these bouts have their own unique merits, which should make for an exciting PPV event. GLORY Last Man Standing is June 21st on PPV for $34.99, following GLORY 17 on Spike TV.